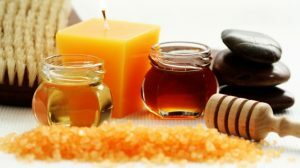 This is a very powerful and detoxifying back massage, honey is spread on the back and when sticky it lifts the fascia and muscle to help relieve tightness, we use different massage strokes as well as a ‘pumping out’ technique that is unique to honey massage. This can be done on any area of the body such as legs, arms or abdomen. Again we use the ‘pumping out’ technique which also draws out toxins that are removed with a hot towel at the end of the treatment. We also use a lovely lavender almond oil to sooth and calm the area after. A course of treatments is really recommended to see great results for cellulite. After cleansing the skin, the honey is applied and worked to the face and neck area. You will notice a much brighter skin tone, great for sluggish skin tones. Produce soothing and rejuvenating effec.